David Brega (Born in 1948) was born in Springfield, Massachusetts. He’s recognized today as one of the foremost contemporary painters of still life in the country. Throughout his more than 40-year career, he has carved out a niche in trompe l'oeil. This is a technique which mimics reality so cunningly that the viewer is fooled into thinking he is not looking at a painting but a real object. Many consider Brega to be one of the best practitioners working in this genre today. Brega has an identical twin brother called Douglas. He also has an older brother called Stephen and younger sister Kathy. The siblings grew up in the neighboring town of East Longmeadow. Brega attended the Paier College of Art in Hamden, Connecticut and both the Los Angeles Trade Technical College in California and the San Francisco Art Institute. While he was at Paier College of Art, he met Ken Davies who became the pivotal figure in his career. 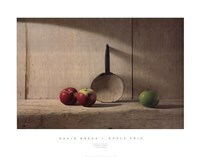 Davies is a still life painter and premier trompe l’oeil of the 20th century. Under the guidance of Davies, Brega trained as a draftsman and technician. In interview in 1986 with Shreve Anita for Connoisseur Magazine, Davies named Brega as his most successful student. In 1986 Brega held his first solo exhibition at the Alexander Gallery on Madison Avenue in New York. In this exhibition, Brega’s art sold out within 15 minutes of its opening, pushing Brega into the Manoogian Collection, one of the largest collections of American art in the world. A second solo show titled, “Please Do Not Touch” followed in 1991 and was equally successful.